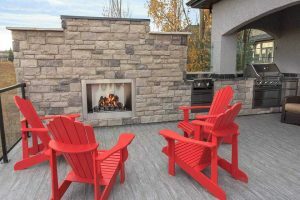 Outdoor Kitchen and fireplace with a custom built deck. Glass railing on sides of deck. Bright red outdoor furniture. - Curb Design Inc.
A beautiful deck with outdoor kitchen and firepit. High quality outdoor kitchen appliances where used for this project. Bright red furniture located on top of the deck. Glass railing on the sides of the deck. Second story balcony and or deck.